Back Row: Peter Devine, Ray Colasimone, Blake Wood, Ed Hanzel Jr., Tim Morris, Jim Ryan, Mitch Giroux, John Goudreau, Ranald "Cracks" MacDonald-Mgr. The Capreol Mazzucas Fastball team won the O.A.S.A. Provincial Championship by defeating Binbrook (outside Hamilton) in their own ballpark. Capreol won the series 2 games to 0 in a best of three. Led by Pitchers Mitch Giroux, Dave Morgan and John Goudreau the Capreol squad had to get past the very tough Kapuskasing Merchants team to get to the final in Southern Ontario. The win was especially gratifying for the team as they had reached the finals several times in the past years only to come up short. 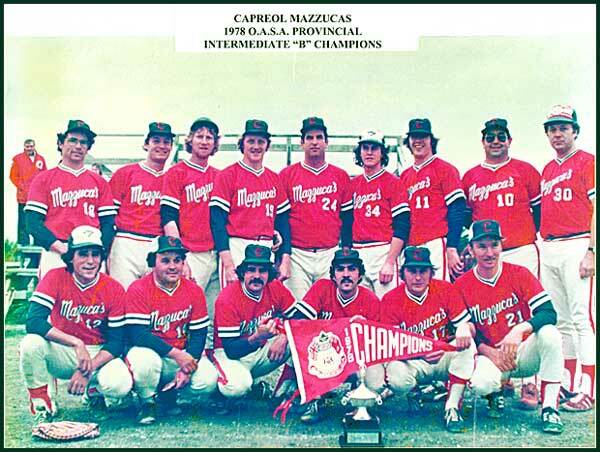 By winning a Provincial Championship they followed the tradition of great Capreol Fastball Teams of the past.